Printed on the back of the menus at Hardware Street's newest resident, Brothl, is the South American proverb, 'good broth will resurrect the dead'. It's not entirely clear if this was a motivation behind Joost Bakker re-launching his café Silo as a broth kitchen (we suspect it wasn't…), but there is no denying the nutritious, feel good hit you get from just one bowl of Brothl's hearty, homemade soups. Opening two weeks ago – a mere ten days after Silo closed its doors – Brothl is a venture into truly sustainable dining. The eatery's concept came about when eco-friendly Bakker, a florist and designer in a former life, noted the ridiculous amounts of nutrients lost in wasted foods, and sought to find a way to reconstitute this organic waste into healthy, nutrient rich food. The solution came to him after reading a number of studies into the health benefits of primitive, broth-based meals in which no part of an animal was ever discarded; hence, the ingeniously named Brothl was born. Bakker and his team, including chef Ryan Bussey, have re-homed unused meat and seafood bones from restaurants including Rockpool, Attica and The European, and harnessed their untapped vitamin sources in the creation of the restaurant's four nutrient-rich stocks. All made using Monbulk rainwater, the fish broth is stewed for 12 hours, the chicken broth for 24 hours, the bone broth for 48 hours, and the vegan friendly vegetable broth, which is made with foraged soil and sea vegetables, for 8 hours. Additionally, if you make it into Brothl before 2pm, you'll find a breakfast broth of organic oats and seasonal fruit, as well. After choosing your preferred base, the next step is to select your favourite add-ons, be they sea bounty mussels, house-made soba noodles, foraged kelp, braised beef brisket, or, if you're feeling super adventurous, chicken feet or offal. On our Brothl visit (never though we'd be saying that! ), we played it safe with the chicken broth packed with poached chicken, thick-cut bacon, mushrooms, and greens and weeds, which on this occasion meant kale, but can change depending on supply. The broth proved itself intensely flavoursome, and things only got better with the more fresh and up-cycled produce you throw into the mix. Plus, each broth is served with a piece of fresh, house-milled sourdough bread, and are best enjoyed with a glass of tangy house made lemonade. 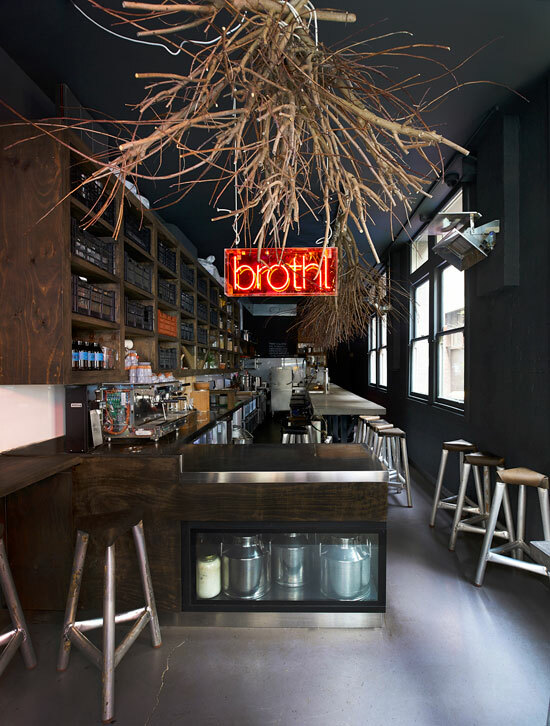 While you might worry that Brothl runs the risk of becoming a novelty by placing such an emphasis on just one dish, Chef Bussey, who had began introducing broths to Silo's specials board during its final months, believes Brothl provides Melbourne with something the city has sorely been missing. While Silo erred perhaps in trying to do too much, Brothl adheres to that old chestnut that it is better to do just one thing and to do it well. And Brothl does broth very, very well. Editor's Note, March 2015: Brothl has now closed due to a council dispute. Image Credits: Brothl photographed by Earl Carter.